Picture the obligatory scene in a sports movie where the unlikely athlete starts to make the turn to star athlete. With an inspirational soundtrack playing in the background, the athlete sweats, grunts, runs, and jumps. Sometimes the athlete will take a few turns through the speed ladder. 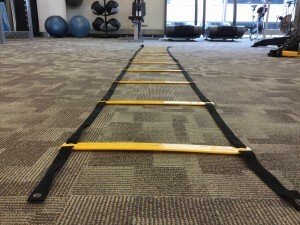 Speed ladders are available for DAHLC member use on the fitness floor. However unlikely the scene that unfolds before us is, there are many benefits to training with a speed ladder. 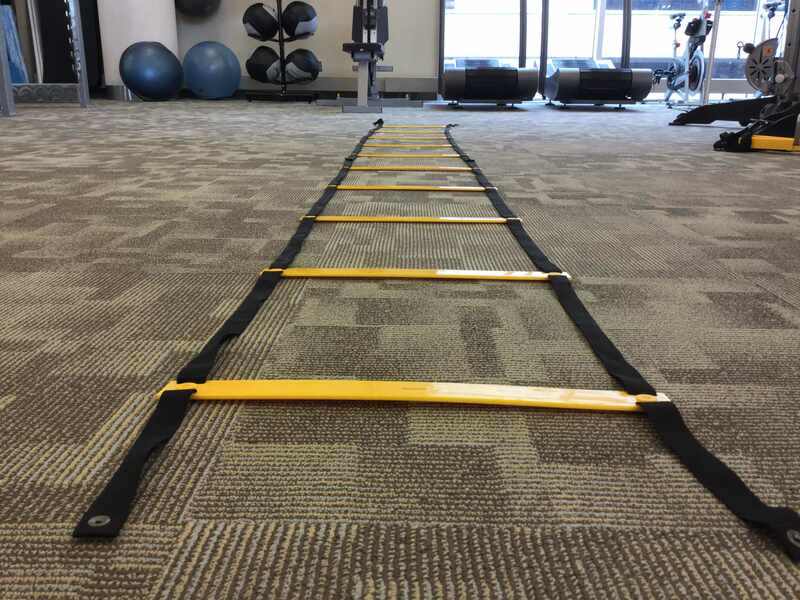 The speed ladder is just one of many tools that may be used to train your power, agility, and balance (PAB). Even if you are not training to be an Olympic athlete, training your PAB can help you reach your personal goals. When you train your PAB, you enhance your balance, reaction time, and speed. Living in Minnesota with our icy winters is reason enough to have good balance and reaction time. When incorporating the speed ladder or any other PAB exercises, complete them immediately after your warm up. An increase in injury rate occurs when these exercises are attempted after the bulk of your workout. Your body becomes fatigued as your workout progresses, making your body especially susceptible to injury. There is a speed ladder behind the fitness desk on the fitness floor for member use. Just simply go behind the desk and you will see a cabinet with a sign asking you to return equipment when finished. You may also use the speed ladder located in the multi-purpose studio next to the free weight area when there are no classes in session. Please keep equipment inside the studio. Lay the speed ladder on the floor in a clear area (one of our training zones is pictured). For all exercises, start slow until you have the form and accuracy. Then you may add quickness. Face forward, place both feet in each square. Lead with your left foot into each square. On the way back, lead with your right foot. Stand sideways to the ladder. Place both feet in each square leading with the foot closest to the next square. Repeat in the other direction. Face forward. Make 2 legged jumps forward, landing with both feet at the same time in each square. Face backwards. Repeat number 1 while facing backwards. Face backwards. Repeat number 3 while facing backwards. For more PAB exercises you can do on your own, ask your Health and Wellness Coach on floor coverage, join a small group training, attend a drop-in cable class, or sign up for an Exercise Prescription appointment. See you around the DAHLC!